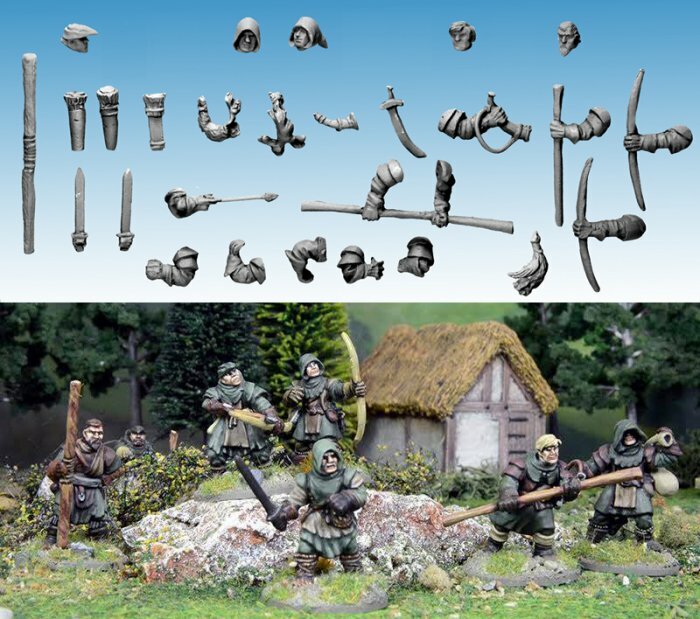 The Forest Outlaws is a set of metal model pieces designed to be used with the North Star/ Osprey Games plastic Frostgrave Soldier and Frostgrave Cultist figure sets. These new heads and arms can be glued onto the plastic figures instead of the plastic parts that come in the box set to add more variety and choice to your figure collection. This first set is titled 'Forest Outlaws' because all the parts are of a forester/ outlaw/ ranger theme. With North Star being in Nottingham, Robin Hoods Merry men springs to their mind of course, but there are many more settings you could put these in. They can be Soldier variants for your Frostgrave warbands, they could be Medieval Villans and Peasents, they could be rangers for any Fantasy RPG, they could be woodsmen for literature themed games like LotR and GoT. The set includes metal heads, arms with more weapons especially bows, staves, hunting horns, captured game and extra weapons. All the pieces in this set are made of metal, are unpainted and designed for 28mm sized figures. You will receive at least 25 metal pieces to customise your Frostgrave Soldiers. It is a random selection taken from the parts shown in the photograph, you are not guaranteed to get every piece shown. The painted models in the photo are plastic Frostgrave Soldiers with the metal Forest Outlaw parts modelled on. Painted by Dave Woodward. The Forest Outlaws is a selection of 25 metal 'bits' to customise your Frostgrave Soldiers, things like new hooded heads, extra bows, staves and captured game hanging from belts.